Fujifilm has just announced the Fujifilm X-T30, the successor to its best-selling enthusiast CSC model. The X-T30 will supersede the Fujifilm X-T20 and includes a range of technical benefits ported down from the company’s highly-rated Fujifilm X-T3. The manufacturer is presenting this package of innovations as ‘Gen 4.1’ – the latest evolution of the X-Series, which dates from 2012. At its UK launch in London, Fujifilm dubbed the X-T30 the "Little Giant" – a small camera with big performance. Indeed, pair the X-T30 (383g) with the new Fujinon XF 16mm F2.8 R WR lens (155g) and this ultra-lightweight combination will weigh just 538g. Leading the X-T30's feature set is the incorporation of the 26.1MP X-Trans CMOS 4 APS-C image sensor and X-Processor Pro 4 image processor. The new sensor debuted last autumn in the X-T3 and is back-illuminated – the electronic wiring is at the back of the sensor, so it can’t obscure the photodiodes at the front. Benefits comprise improved light-gathering capability, so f/1 super-high-speed lenses come into play, plus higher image quality. Add this to enhanced autofocus performance, various bumps to features and functions and the inclusion of all the renowned Fuji film simulations, and we reckon the X-T30 should have little difficulty in exceeding the popularity of the X-T20. Starting on the outside, the X-T30 has a near-identical form factor to its predecessor. The body is slightly slimmer, thanks to the rear LCD being 1.3mm thinner, and a new grip shape offers better handling. The pop-up flash is retained, and a USB-C port will cater for up-to-the-minute connectivity needs. A revised rear panel design majors on a new Focus Lever, for switching autofocus points and changing settings. The round control button from the X-T20 has been removed. 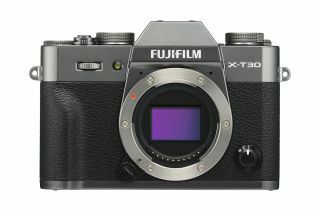 Available in the established black and silver, X-T30 buyers can also choose to have the new Charcoal Silver finish, if they can delay their purchase until May. And good looks are certainly an X-Series USP: tactile old-school manual controls sit alongside automatic shooting modes, helping make the range a lifestyle camera choice for many young photographers. Inside, the X-Processor 4 is three times faster than the previous X-Trans CMOS III. Phase detection AF covers 100% of the frame, and there’s improved face and eye tracking. This can be selected via the LCD touch panel or Focus Lever, and there’s non-stop phase detection AF when focusing from distance. When composing via the viewfinder, the image has been made smoother and brighter than that of the X-T20. Low-light capability has been stepped up, too, thanks to 2.16m phase detection autofocus pixels, compared to 0.5m in the previous version. This means the -1EV of the X-T20 has been extended to -3EV on the X-T30. Standard ISO sensitivity is 160. The Face and Eye Detection AF algorithm has also been improved, supporting a smaller face-tracking area for extra precision: where the X-T3’s starts working at 10% of the vertical range, the X-T30’s works at 7%. A single X-T30 AF point processes four times more data that a single point on the X-T20. The new Face Select function allows shooters to select their main subject using the LCD touchscreen and focus lever: the camera will track the designated face even if it is moving in the frame. AF speed has been improved, too. Non-stop phase detection AF means faster focusing even when there’s a huge gap between subjects. It’s up to 300% faster when focusing from far to near and near to far when using the system, especially when using longer telephoto lenses. Other technical improvements see up to 30fps blackout-free bursts when using the electronic shutter at a 1.25x crop, or 20fps without. An 8fps burst is possible when using the mechanical shutter. Film and video users haven’t been excluded from the X-T30’s improved feature set. The X-T30 offers the same UHD 4K/30p capability as the X-T3, with in-body 48KHz 24-bit high-depth sound recording. There’s a new Eterna cinema film simulation, and enhanced tracking speed and stability for Face and Eye Detection AF. Video input is 6K, with 4K output at 30p (non-cropped). Other improvements made for this latest X-Series camera see enhanced connectivity to smartphones via Bluetooth and Wi-Fi, over an updated Fujifilm Camera Remote app (version 4.0) which comes to iOS in March and Android in May. A forthcoming firmware update (due in April) will bring the ‘Gen 4.1’ functionality of the X-T30 to the X-T3: improved face and eye tracking; stable exposure in Face and Eye tracking; support of smaller face tracking (7% from 10%); Face Select using touch panel or AF lever; non-stop Phase Detection AF; and quick touchscreen response. Capture One comes in three versions: the full Capture One edition which supports all camera brands, a slightly cheaper Capture One Fujifilm edition for Fujifilm cameras only, and a free Capture One Express for Fujifilm version with a reduced set of features but the same high-quality raw processing. Phase One recently announced a collaboration with Fujifilm which greatly extends support for Fujifilm cameras and new Film Simulation profiles in Capture One. The Fujifilm X-T30 will be available body-only for £849 /$899, in a kit with the Fujinon XC 15-45mm lens for £899 / $999, or with the Fujinon XF 18-55mm for £1,199 / $1,299. The silver and black editions go on sale in March, with the Charcoal Silver finish arriving in May.